In celebration of the 70th anniversary of John Lennon's birth, Steinway & Sons have announced a special Imagine limited edition piano. The piano is modeled on the famous white piano which featured in the video to Imagine. The instrument is still owned by Yoko Ono and is kept at the Dakota building in New York City. The new piano comes shortly after the announcement that Gibson are to issue three Lennon-inspired acoustic guitars, priced at between $4,700 and $15,000. No price for the Steinway has yet been announced. To commemorate the 70th birthday of a true creative genius -- legendary musician and songwriter John Lennon -- Steinway & Sons has introduced the Imagine Series Limited Edition piano. 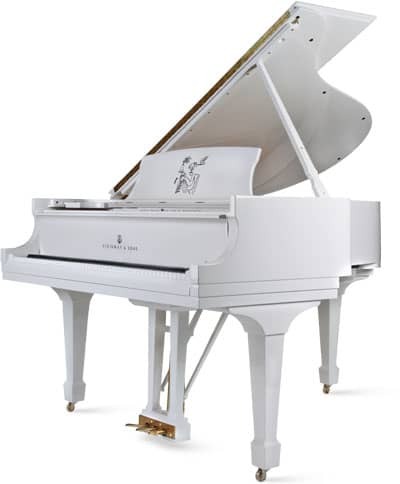 The Imagine Series Limited Edition is modeled after the white Steinway grand piano that John Lennon presented to Yoko Ono on her birthday in 1971, which is still at their famous Manhattan residence – the Dakota. The music desk of each piano incorporates one of four different John Lennon original drawings. Come Together, the title of the opening track on the Beatles' historic album, "Abbey Road," reflects John Lennon's desire to bring people together. Grand Piano is a drawing that captures the songwriting process -- as musician and piano become one. Freda People exemplifies John Lennon's passion for using music for the benefit of mankind. Self Portrait is perhaps John Lennon's most famous drawing -- as just a few marks on the page and it's unmistakably John. "I am very excited about the launch of this truly unique piano," said Ron Losby, President, Steinway & Sons – Americas. "John Lennon was a visionary in so many ways. 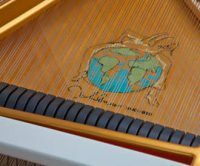 It is an honor for Steinway & Sons to have been chosen by Mrs. Lennon to create this remarkable piano." Since 1853, Steinway pianos have set an uncompromising standard for sound, touch, beauty, and investment value. Steinway remains the choice of 9 out of 10 concert artists, and it is the preferred piano of countless musicians, professional and amateur, throughout the world. For more information, visit www.steinway.com. Really? I was wondering just who this is aimed at. Surely if someone had enough money to buy a new Steinway, they wouldn’t want a load of John Lennon doodles all over it? I’d definitely rather have a plain white one every time. i heard that the piano that george michael bought for 1.6 million english pounds on which john lennon COMPOSED ‘imagine’ on is an upright piano.